FIRST TIME EVER ON THE MARKET PARADISE 808 MAUI is truly Your Own Private Eden and quite frankly the most unique property you will find in Hawaii much less in South Maui for quality, size, privacy and seclusion!! The attention to detail is phenomenal! 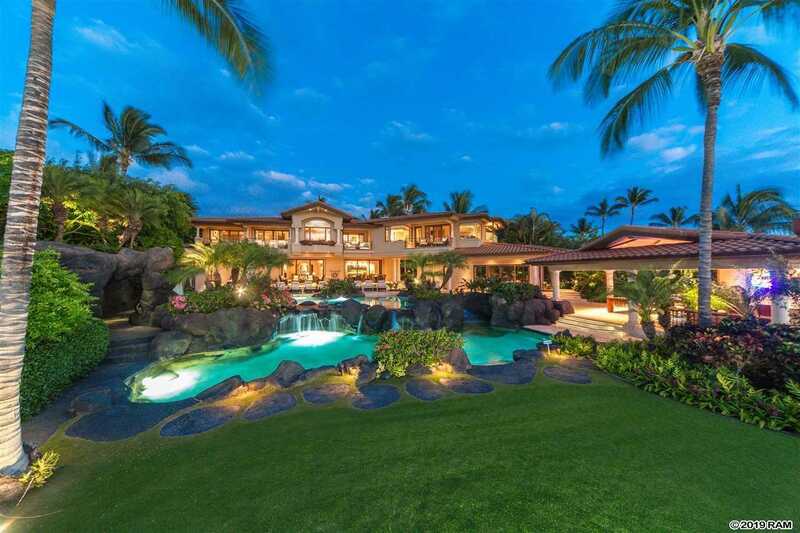 You will be amazed arriving through the two separate electronic gated entries into this two-acre fully walled residential resort style Sanctuary featuring sweeping Ocean Views, Sunset Views, Outer Island Views and terrific Haleakala Sunrise Views. Elegant, Meticulous, Inspiring and Inviting best describe this fully furnished, turn-key, custom designed 12,300 sf under roof compound featuring over 2000 sf 4 hole golf putting green with 2 sand traps backing up to Ulupalakua Ranch, extensive covered and uncovered Ocean View lanais, oversized 4-car garage also including separate A/C and additional storage. The mature and lush landscaping features 48 palm trees, 50 fruit bearing trees, and much, much more! Situated at 650â elevation, you will love the cool tropical breeze yet so conveniently located within a 3 minute drive to South Mauiâs finest white sand beaches, the Wailea Resort with fine dining, exclusive shopping in the Shops at Wailea, ocean activities and of course spectacular golf & tennis. This is the ONLY resort style compound of its kind on Maui with amenities that include a state-of-the-art full security system with infrared cameras, Crestron smart system, Airport quality WiFi system, Kaleidoscope TV system with 4300 privately owned movies, 120 PV Solar panels, 21 day auxiliary backup system, pool grotto and fully stocked pool cabana with spacious 12-seat bar. The thoughtfully planned design features 9-zone central A/C, six bedroom en-suites, each with two closets and its own bathroom suite - nine bathrooms total - Peteâs bar with 180 bottle wine room, 650 gallon fully stocked saltwater fish aquarium, wheel chair accessible elevator, custom designed Maple staircase and iron railings, Maple doors throughout, jetted tubs, steam shower, fully equipped fitness center, sunken media room, two commercial laundry rooms, three heated pools, waterslides, waterfalls, ponds, river, volleyball & badminton. The fully stocked professional chefâs gourmet kitchen includes Maple cabinetry, multiple sinks, book matched granite countertops, two Subzero refrigerators & freezers, refrigerator drawers. two Wolf propane cooktops, three ovens, two Bosch dishwashers, TV and an enormous walk-in pantry. This is truly for the discerning Buyers!! PARADISE 808 MAUI is 2 very private and secluded acres nestled in a quiet residential community, Kaimanu Estates, backing up to Ulupalakua Ranch overlooking the sunny leeward Makena-Wailea-Kihei coastline. The Island of Maui was voted #1 best island in the WORLD by Trip Advisorâs 2016 Travelersâ Choice Awards! Maui was also voted #1 best island in the U.S. by Conde Nast Travelerâs Readersâ Choice Awards published on October 18, 2016. Please, send me more information on this property: MLS# 381211 – $22,808,000 – 120 Kaimanu Pl, Kihei, HI 96753.